I am so glad that winter is coming to an end here in the panhandle of West Virginia. It was a long cold winter and I am ready to move on to spring! I have so much yard work to do to get my garden back into shape to plant my herbs and veggies again. Oh I can’t wait! I find gardening to be such rewarding work. I’ve tried to get my daughter out there with me to work in the dirt and plant the seeds, but she wasn’t into it last year. 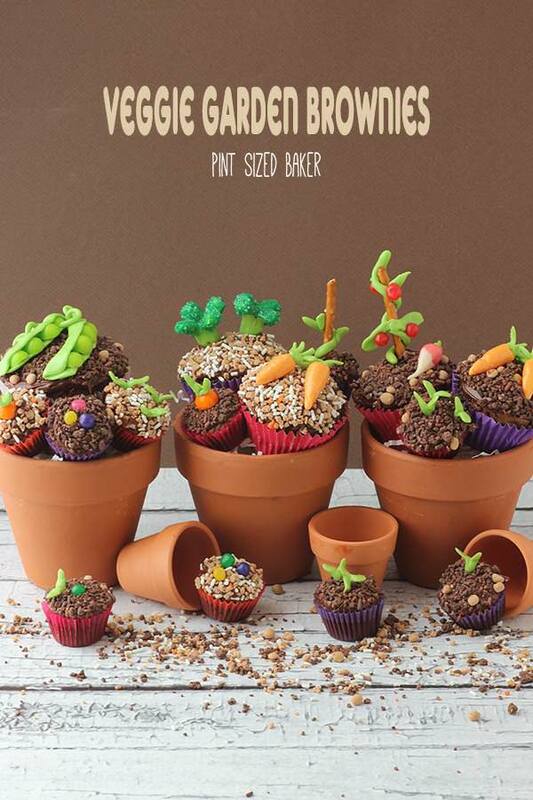 Fingers crossed for this year… She did however, love to get messy with these fun Veggie Brownies. They are very easy make and if the kids can work with clay, then they can work with candy. 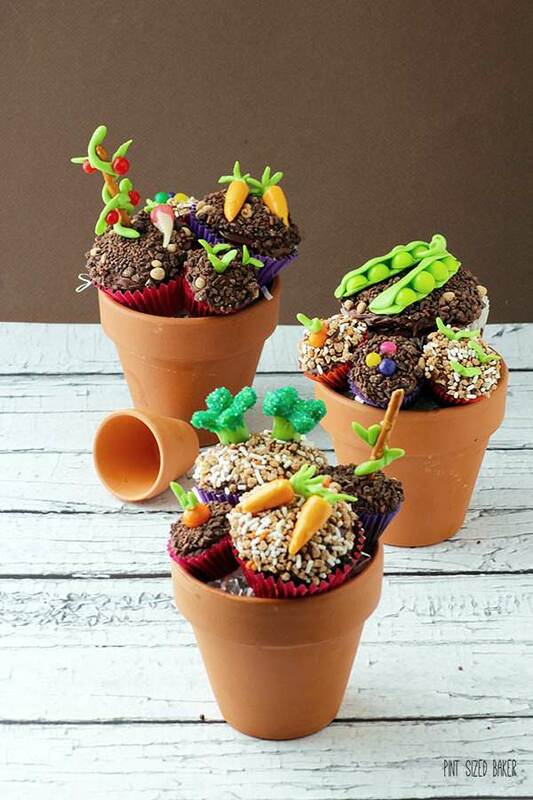 Have the kids can make the “veggies” while you bake the brownies. These fun brownies are perfect for April Fool's Day! 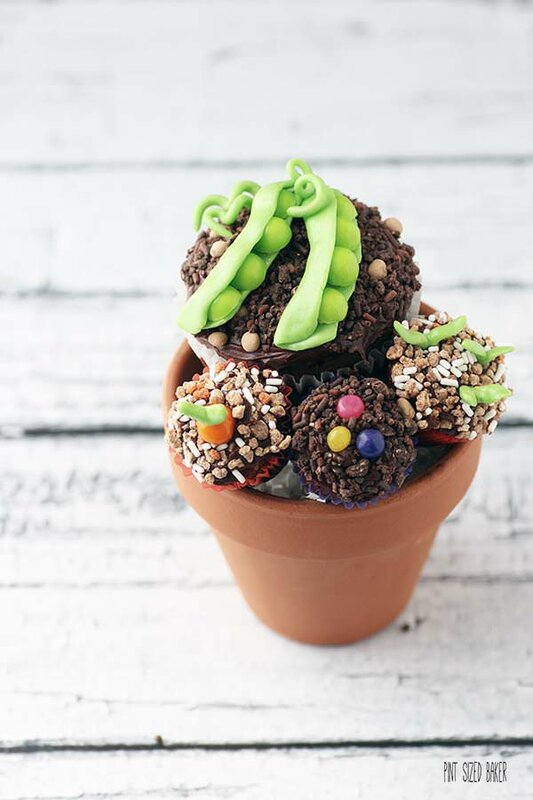 What kid wouldn't enjoy a candy veggie brownie for dessert? Make the Brownies according to the instructions. Bake 8 standard sized cupcakes and use the remainder to make mini cupcakes. Bake the standard brownie cupcakes for 20 - 25 minutes and the mini cupcakes for 15 - 18 minutes. Set aside to cool. Flatten one green candy and cut 2 green gumballs in half. Place the gumball halves onto the side of the green candy, then fold the candy over and pinch the top and bottom closed. Roll out more candy to create the curly vines for decoration. Break an orange candy in half and shape into a carrot. Break off ¼ of green candy to create the carrot greens. Flatten the green candy, with a sharp knife cut fringe, roll the green up and attach to the top of the carrot. Fan out the fringe. Cut an orange gumball in half and add some greens to the top. This will be the carrot in the ground. Take a green candy and cut it in half from the center, then in half again so that you have a stalk and four arms. Fan out the arms and smooth the edges. Spread a small amount of green cookie icing in the arms and spread it around the top of the candy (a little bit goes a long way). Dip the top of the candy into the dark green sprinkles to create the broccoli. Roll out a long vine of green candy. Add little "leaves" and use some red fruit flavors to be the tomato. Using a Pretzel Rod to support the vine, wrap the vine around it and press the candy to adhere and stand up. Take ¼ of a red candy and shape it into a sphere. Take ¼ of a white candy and add the root. Add the green the same way from the carrot. Take small pieces of green candy and roll to 1.5 inches, fold in half and flatten to create the leaves. When the Brownies are cool, frost and dip into the Decors to create the look of dirt. 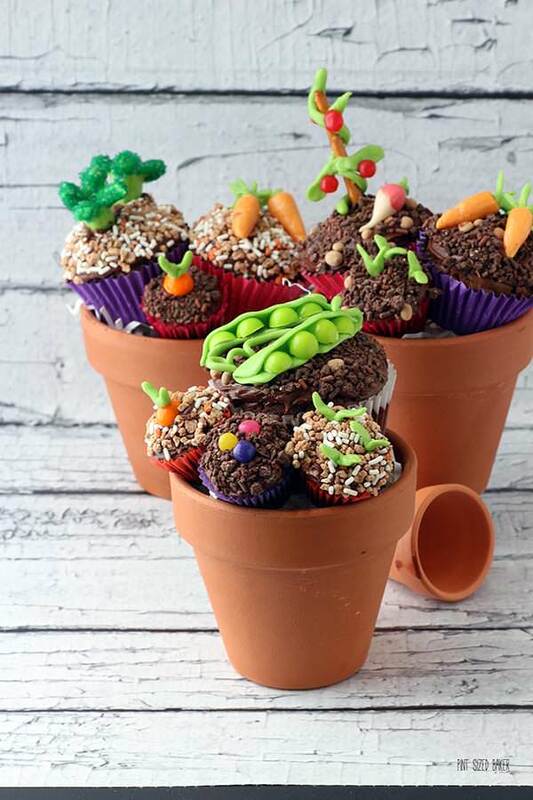 Add your candy veggies and place two standard brownies and two mini brownies into a 4 inch terra cottta pot. They will be snug, but the brownies held their shape and won't smoosh like a cupcake will. My kid LOVED these fun veggies. She wanted to make more and more and more, but there’s only so much time in the day. You can totally play around with different candies to make all sorts of veggies. Use Corn Flakes to make some lettuce or cabbage. Build some corn stalks with dry spaghetti, vanilla tootsie pops and white sprinkles for cauliflower. Just let your imagination run wild and make your favorite vegetables. Don’t have some of the fun sprinkles? There’s so many at your local grocery store and craft store. Look at fun candy shops for different candies that you can use. Sometimes the treasure hunt is more fun! 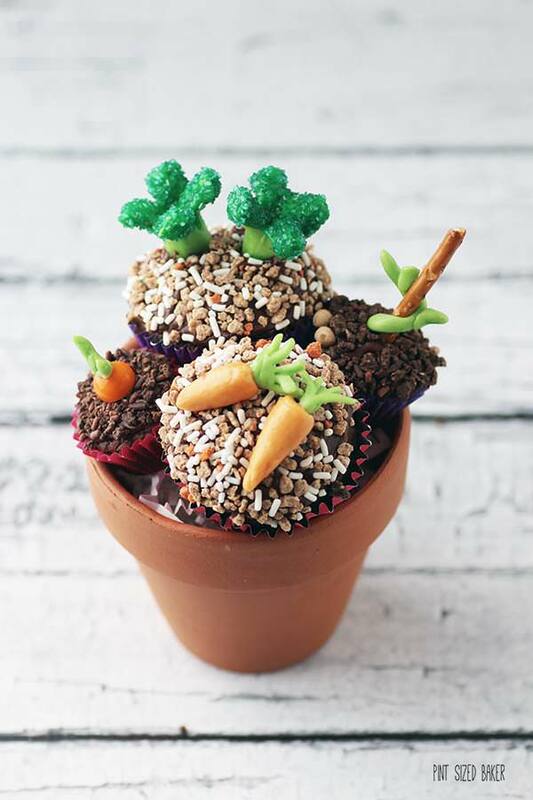 These Veggie Brownies will be so much fun for April Fool’s Day as well! Be sure to play it up for the kids and let them know they are getting veggies for snack! Lol! Then watch the expressions on their faces. They’ll love it!